There is a place on every climbing trip for a walking guide, hiking is a great rest day activity and if you have family then some walking is going to be on any holiday adventure. Cicerone produce the UK’s most comprehensive guidebook selection in the UK, they cover all areas of the UK as well as plenty of overseas books. The latest Cicerone guides have all gone through a style revamp and the new look is very modern and fresh. We received the new Isle of Skye guidebook and the Southern Uplands for a review to see what they have to offer for a visit to Scotland. The Isle of Skye guide came at a very fortuitous time for me as I’m planning a visit to complete the Cuillin Ridge this year. The guide is written by Terry Marsh has the whole island comprehensively covered with a variety of walks for all tastes from easy rambles around headlands and peninsulas to the famous Cuillin and everything in between. This would easily be the only hiking guide you would want for the island. The descriptions are detailed and accompanied by an OS 1:50 000 map of your chosen walk. The mapping is accurate enough to use in an emergency but would only cover your route and nothing else. There is a great general description of the route in the blue box at the beginning which has descriptions of interest about the area you are walking in. The guide comes with a hardwearing plastic cover and is a nice compact size. Now to the main event for climbers – the scrambling and The Cuillin Ridge. There is no doubt that The Cuillin Ridge is the ultimate test of alpine skill in the UK and should be on every mountain lovers tick list. It is certainly a major gap in my own tick list and one I need to fill. So I was interested to see how the guide helped me plan for this. Unfortunately I was disappointed as the whole section felt very disjointed – I understand that there more to Skye that the Cuillin Ridge but it is such a famous traverse that I felt it should have had a more prominent section in the guide. Each section of the ridge is described in great detail and main section of the ridge has a description, but when I complete the walk myself there is no way I will be wanting to carry a guidebook so I feel I will have to photocopy each section of the route and try to stitch together a useable guide to the ridge. More help with the logistics of how to tackle the ridge would have been invaluable for example, kit lists, escape routes, bivvis (if being taken) would have been brilliant. 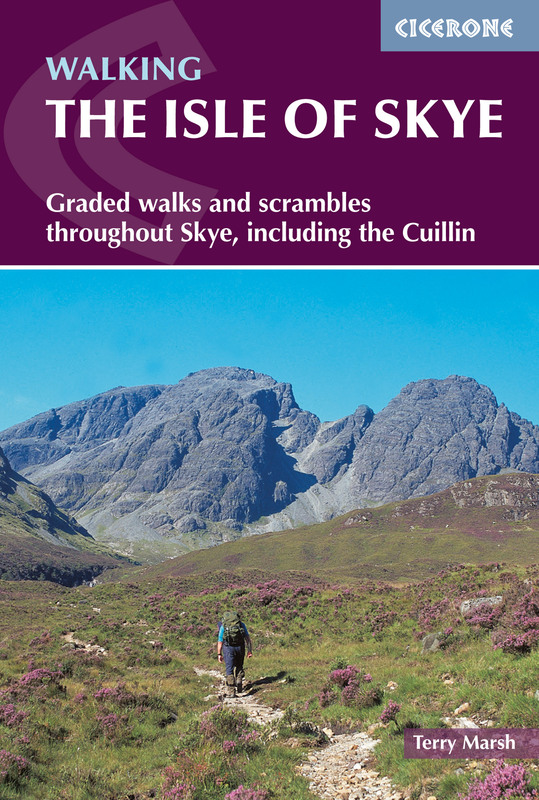 I do however fully understand that there is more to Skye than the Cuillin and the author has made a great job of detailing the island and his enthusiasm for the more remote corners is apparent in the route descriptions. Any trip to Skye should have scrambling as a must; it has some of the best the UK has to offer. Terry has thoughtfully included these in his route descriptions. Scrambles are easily recognised by the brown symbol and the description in orangey brown writing. There are ample warnings throughout each description of the dangers of scrambling and these should be read and preparation taken. All in all the Cicerone Isle of Skye guide is a well research and written guide that is a perfect companion for your trip and collection. The author is clearly an expert and shares his knowledge in an easy to read way. The new fresh look is much more modern and appealing to boomers and millennials alike. One suggestion I would make, instead of having a written description of the route in the blue box at the beginning Cicerone could have a bulleted list of the main walk features that are cross referenced to the map. This would provide an ‘at a glance’ route description when on the move. 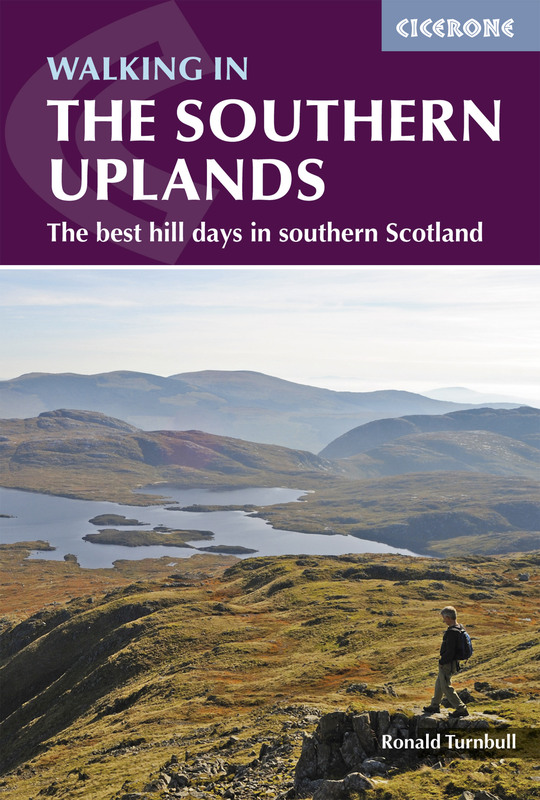 The Cicerone Walking in The Southern Uplands is another new guide for 2015. My knowledge of the area centres around taking school groups up Merrick in Galloway (as well as the excellent climbing)and looking for a melting Grey Mare’s Tail in Moffatt. I do however drive through it every time I’m heading North or South and I feel the area would be an ideal destination for a short day or even an overnight stop. Especially in Northumberland where I often retreat to for bouldering and running weekends. So the guide is useful for both the occasional visitor and for someone who wants to explore some of the lesser known and wilder areas of Scotland. The author, Ronald Turnbull, is again an expert in the local area with an in depth knowledge of every nook and cranny and with 44 walks (which can be turned into runs of course) there is something for everyone. My main interest with the guide would be to plan stopping off points on the way and back from the Highlands, mostly within easy reach of the M74 and the map of walks locations would have benefitted from having the road numbers on them making for easier planning. Apart from that there is plenty of detail in the walk descriptions and the mapping is detailed enough to warrant leaving the main map behind for short walks. The new style feels fresh and modern and my wife enjoys walking in this type of terrain so the guide has piqued our interest for a short holiday in the region. So all in all another great guide to add to your collection and the area certainly calls for closer exploration.